I’m not talking about the Benedict Cumberbatch version of Sherlock, or even the Basil Rathbone version of Sherlock. I’m talking about the original, fictional, A. Conan Doyle version of the famous consulting detective. I know what you’re thinking, “What, in all possible worlds, could a fictional character from the turn of the 20th Century, who has the emotional sensitivity of a coffee table, have anything to do with veteran mental health in the 21st Century?” Well, apart from the fact that Holmes’ intrepid companion, Dr. John Watson, is a veteran of the war in Afghanistan…actually, the Second Anglo-Afghan War that was fought from 1878-1880…there are a few specific things that Holmes knew about veterans that could be applied to their current mental health and wellness. First, veterans were to be found all over the Sherlock Holmes stories. Not only the indomitable Dr. Watson himself, but as major and minor characters in many different places. In The Sign of the Four, Holmes solves the mystery of Mary Morstan and a stolen Indian treasure. Mary’s father, Captain Arthur Morstan, was a commander of an Indian regiment, and the story describes temptation and betrayal. The brotherhood of combat and the impact of injuries sustained in battle is recounted in The Adventure of the Blanched Soldier. The Royal Marines even get in on the action; in A Study in Scarlet, Holmes pegs a former Sergeant of the Marines just by the way he carries himself, his confident air of self-importance, even by his tattoo…sounds like a lot of veterans I know today. More than just veterans in the stories, however, some of the stuff that Holmes said can apply to veterans today. In A Case of Identity, Holmes tells Watson that, “You did not know where to look, so you missed all that was important.” As I’ve said before, awareness is key to recovery in mental health. Until we become aware of how we think impacting how we act, we will often be on autopilot. If we don’t know where to look…the thoughts in our head, the unquestioned core beliefs that drive our reactions and our behaviors…then we miss something truly important. How many times have we “felt” emotion, not just cognitively but in our bodies? Fear as a lump in the throat? An elevated heart rate as an indicator of fear…or anger? If veterans experience these things, but don’t notice them, then warning signs of uncontrolled emotions could be missed. So, the lesson from Holmes here is, pay attention to what matters. Be mindful. Critical to mental health in general, but especially to veteran mental health. The quote that brought this subject to my mind, however, was another from The Sign of the Four. Holmes tells Watson, “How often have I said to you that when you have eliminated the impossible, whatever remains, however improbable, must be the truth?” This is a trap that I see many veterans fall into. They often do not want to examine the real reasons for dysfunctional behavior or maladaptive coping skills, because they may find that what remains…however improbable…is actually the real reason for the challenges they’re experiencing. The fact that a veteran can’t get or keep a job is not always because the hiring manager hates veterans or they don’t understand how hard it is; maybe it’s because some veterans spend time feeling entitled, that the world owes them something, and an observant employer can pick up on that as easily as Holmes picked up on the indicators of the retired Sergeant of the Marines. Maybe marital difficulties are not the cause of the spouse, or the in-laws, or the kids…maybe the difficulties lie closer to home, in the veteran themselves. We can blame the source of our drinking on the war, the military’s culture of alcohol use, on the way it makes us feel…but if, like Holmes, we systematically consider and reject each of these as the cause of our behavior, whatever remains…our thoughts and core beliefs…must be the truth, no matter how improbable, how unpleasant, and how much we want it not to be. There are certainly situational and systematic influences on our behavior, but those only impact us as long as we are unaware. Once we become aware…once we “know where to look” as Holmes says…we have both the ability and the responsibility to change in order to lead a more stable and fulfilling life. 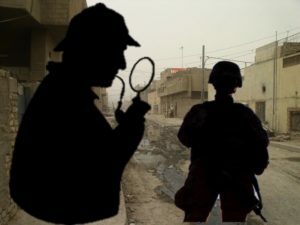 Is it a stretch to draw a parallel between Sherlock Holmes and the thoughts and beliefs of veterans today? Maybe, but then again, one of the reasons that A. Conan Doyle’s fictional detective has stood the test of time is the insightfulness of his observations, coupled with the courage…and humanness…of the combat veteran, John Watson. And, by the way, as any good Sherlockian can point out, the phrase, “Elementary, my dear Watson” was never mentioned in the original written works. But he did say the rest of this stuff.